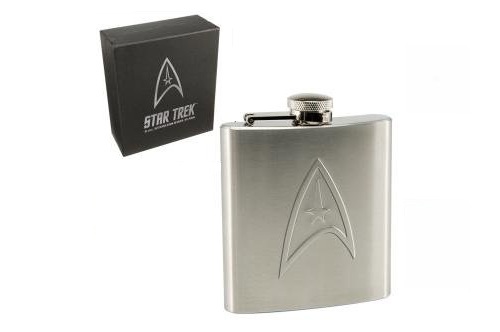 This Star Trek Stainless Steel Flask features the Star Trek emblem on the front of this drinking flask. Top lid is permanently attached to prevent loss. Comes packaged in a sleek black gift box. Hold 6 ounces. Hand wash recommended but is dishwasher safe. Measures 3.75" x 4.5" high. Price: $21.95 & FREE Super Saver Shipping on orders over $25.